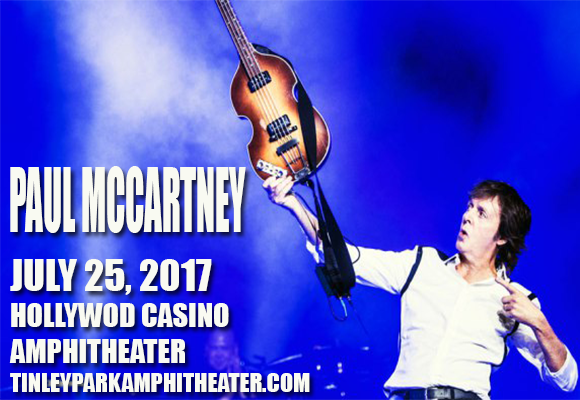 Legendary Beatle and music icon Paul McCartney comes to Hollywood Casino Ampitheatre on Tuesday 25th July 2017 as part of the 2017 leg of his One on One Tour! A member of rock and roll royalty, McCartney will be performing classics from his latest compliation album, Pure McCartney, and will no doubt throw in a few surprises too! Best known as a member of arguably the greatest band of all time, the Beatles, Sir Paul McCartney MBE is an English singer-songwriter, multi-instrumentalist, and composer. One of the most successful composers and performers of all time, McCartney's Beatles song "Yesterday" has been covered over 2,200 times, more than any other copyrighted song in history, and "Mull of Kintyre"(released with Wings) is one of the all-time best-selling singles in the UK. McCartney has been inducted into the Rock and Roll Hall of Fame twice (as a member of the Beatles in 1988, and as a solo artist in 1999) and has won 21 Grammy Awards. He has been the writer or co-writer of 32 number one hits on the Billboard Hot 100 and as of 2009 he has 25.5 million RIAA-certified units in the United States.